There is a thing that I have thought about for about 10 years and that is state dependent doors. I especially thought about it regarding Elimination. I have now implemented a door that are only open while the weapons are live in Elimination and CTF Elimination. The important thing is "targetname : elimination_active"
I don't know if there are other places this could be relevant. Like doors that once triggers stays open until next capture? This does require OAX Beta 52: https://github.com/OpenArena/gamecode/releases/tag/oaxB52 or the latest nightly build. I suppose that will clash with already targeted doors (i.e. button-triggered doors). What about making it a spawnflag or an independent key i.e. "eliminationactive" "1"? It does become a problem if the map contains a trigger with the name "elimination_active". I could add a "statetargetname" instead. That they the doors could still be opened with normal shots in other game types. That would be better, indeed. I have not understood completely... what do you mean with "when the weapons are live"? "When the weapons are live" = "when players can use weapons in an Elimination match". These doors seem to work like the doors in Team Fortress 2. Once you enter the match, you have to wait until the doors are open in order to fight. This is more for directly-connected spawn rooms, for example. I may play a bit with this in a map. Thank you NK. It has got sense. Added state_targetname instead of targetname. Of course state_targetname does still overrule targetname in Elimination games but only in Elimination games. do you mean that with current nighly builds (it has been done AFTER OAX B52, right? ), to test the feature, we have to set "state_targetname/elimination_active" key/value pair on func_door entity, right? I have not exactly understood what happens if one sets both it and a classic "targetname" (e.g. 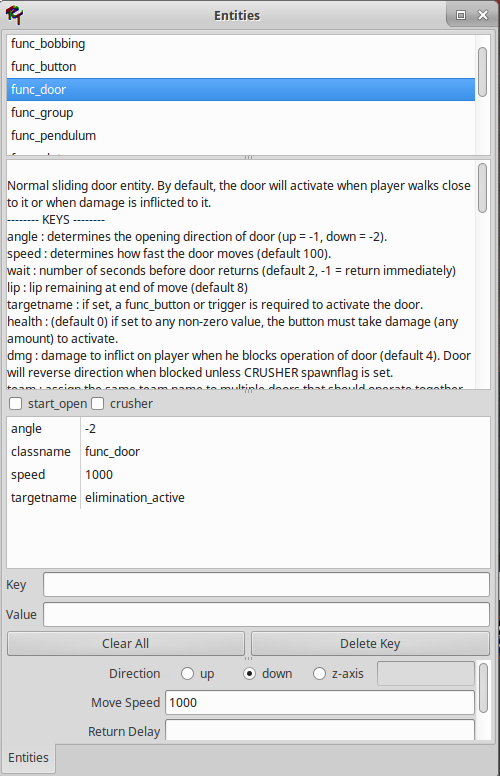 to make the door button-controlled) keys in the same door, in Elimination and CTF Elimination modes (while other gametypes shoud just ignore "state_targetname/elimination_active" and the door work normally -player/shot or trigger controlled- right?). You need the nightly build. The button will be completly ignored in those game types. State takes precedence. To sum up, a door with "state_targetname/elimination active" key/value pair, in Elimination and CTFELimination modes will be closed during inactive warmup and after that always open no matter what, if I undersood correcly. Other modes are unaffected. Now, looking at actual usage of this.... what is this intended for? - Main usage: isolate areas of the maps during initial part of Elimination warmup (hence, usage with team-dedicated spawn points is required), to keep the two teams initially divided. - Secondary usage: keep open accesses to hidden areas in Elimination mode, to minimize the bad habit of camping in a secret area to win the match avoiding camping. But for this purpose, probably using "!gametype" key (completey remove the door in selected gametypes) woud be better, because that can be applied to Last Man Standing, too. - Something more? Did I say something wrong? This is the only scenario I see at the moment. I do consider if there could be other options. Like doors that are only open/closed depending on the flag being at its position or not. Originally I actually though about regarding a possible Assault gametype there doors are open depending on phase. Thinking again about this feature... maybe it may be even more useful by opening the doors at the beginning of the "real" fight, instead of opening the doors at the beginning of the active warmup. That was what I meant by "while the weapons are live". I do not open the doors until the warmup is over. Fight begins: Doors are opening and stays open. Now the whole thing has got more sense.